Follow along as we design and build our custom dream home. The hunt for more space and privacy began about 2 years ago. Sept 28th, 2015 to be exact - I just checked the date from the first text message our relator sent me after our phone conversation about wanting more space. But before I get into that, lets take a look back at what led up to this decision. We currently live in a beautiful home in a very sought-after neighborhood; people are foaming at the mouth to buy a home in our area. Good size houses, schools within walking distance, nearby parks and restaurants. Which is all great! But also not so great. When we bought our home in February 2009 it was the beginning of the Great Recession. Housing prices were plummeting and tax credits were being issued like Monopoly money to try to save the market, but it wasn't working. New neighborhoods were stopped in their tracks as developers were going bankrupt - it was a buyers dream. We had been living in a tiny 700sq. ft. apartment for the previous three years saving up to purchase our first home. The market crashed and housing prices were at an all-time low, so it was finally time to make our move. We found our home in a new neighborhood on the outskirts of town. The neighborhood was just getting started, there were less than 20 houses built, foundations for 3 more were poured and the skeletons of 2 more homes were waiting to be finished. Our home was already complete, the sellers (and first and only owners) had lived in here for barely a year before the husband received a job transfer out of state. So it was perfect. Scary good price (buyers market!) plus motivated sellers (moving out of state) and a beautiful neighborhood outside of the city but close to its own schools, restaurants, and grocery stores. We were in love! And it stayed that way for about 8 years. Twenty homes in a neighborhood that was plotted for 60 homes. It was empty and peaceful. We had neighbors, but they were several lots away. We had deer at our fence every night. The quiet hooting of owls was so peaceful. The stars were gorgeous. And then the Recession suddenly ended. Within 2 years time our neighborhood was suddenly booming. I haven't seen a deer by our house or heard an owl in years. Traffic is insane. I can look out of my kitchen window and see what our neighbor is having for dinner. Our faux country-living had come to an end. We didn't realize it at first, but we had become unhappy with our home. Our 0.25 acre lot was suddenly feeling like our 700 sq. ft. apartment again. So we started to explore the idea of looking for a bigger house on a bigger lot. We called our amazing Realtor that helped us find this home and told him our thoughts. Within the week we had appointments set up to look at houses in gated communities that sat on 3 to 5 acre lots. Now, we're not being uppity. A gated community = no through traffic. Therefore we don't have to worry about cars speeding down our street, cutting through our neighborhood so they can get to their neighborhood, while we're trying to teach our kids to ride their bikes on the sidewalk. Acreage meant we didn't have to know what our neighbors were eating for dinner that night; and could hear the owls and see deer again. We had truly missed that. We found several properties that we really liked, and one that we really loved, but overall it wasn't feeling right. We soon realized that we didn't want to simply move into another home, we wanted to make something completely our own. So that meant we needed to find an empty lot. Not an easy task given that the recession was over and people were gobbling up land like it was hundred dollar bills thrown on the ground. We realized fairly quickly that to find any land at a reasonable price we needed to look a but further out of town. Aaron works in the next town over, about a 25 minute drive through the back roads, so we concentrated our search between here and there. After about six months of scrolling the MLS listing and not coming up with anything that appealed to us, we started to become discouraged. Things that would turn us off of a property: to big a size (remember we were looking for 3-5 acres), location, price, sinkholes (a major factor in this area), or not very well kept neighboring properties. It was feeling impossible to find something that rang all the bells. And then one day Aaron called me and told me to pull up a particular listing. It was one I had look at many times before. 15 minutes from our current house and 10 minutes from Aarons work. Beautiful rolling hills and peaceful farms surrounding it. The only problem was it was 100 acre horse farm! Full of paddocks, staff housing, barns and all the accompanying equipment. All this meant that it was way out of our price range. But this time the listing had a note telling people that there was a corresponding listing. Interesting! 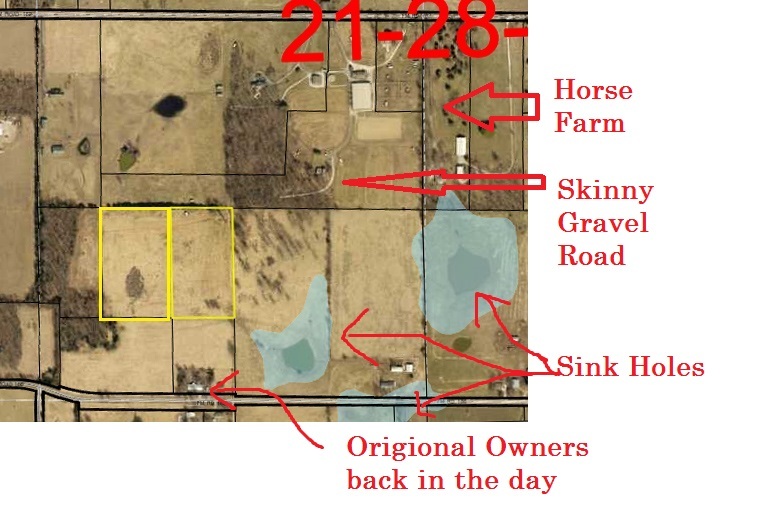 Looking at the sister listing, we saw that the owners had decided to break off a 16 acre parcel that sat by itself, tucked in the middle of four other properties but connected to the main part by a skinny gravel drive. It was currently being used as a horse pasture. The pictures looked gorgeous, the price for this piece was beyond good and the overall location was perfect. So why hadn't this been snatched up yet? There had to be a catch. We needed to find out. So we called the realtor that had the listing and asked to view the property. We didn't want to call our realtor just yet in case this was another dead-end; we had had several at this point. So we set up a time to go see the property and we're cautiously optimistic. At our viewing, we learned that this particular piece of land used to belong to the farm to the south, and there was a legal road easement that came with the property that lead directly to the main road. That meant that the buyer had legal permission to cut in a driveway from the main road just a few yards away, and there would be no need to drive through the horse farm to access the property. We also learned that no one else had called on the property in the months that it had been available. There were no sinkholes on the property, it was already fenced in (formerly being used as a horse pasture), beautiful unobstructed views and best of all, it was priced well under market value! So why hadn't it been snatched up yet, you ask?! The listing agent had screwed up and marked the property wrong on the listing map so no one else could find it! Aaron drives this area every single day to and from work, so one look at the property details and he knew exactly where it was!! So, we played it cool (we think) to the listing agent, thanked her for her time and made our way home. And promptly called our relator and told him we had found our dream property! It was a little larger than we were originally going for, but the price and location were worth it! We went out to the property with our relator and got his take on it. He agreed that it was a great piece of land and the price was a dream. So we made an offer that evening. Now, someone might think that we weren't being fair to the listing agent. We called her for a viewing so we should just make the offer through her. After all, they are required to be fair to both sides in instances like this. But let me tell you; it was a good thing we didn't make an offer through her and decided to stick with our relator. After putting in the offer, we received a call almost immediately that another offer had come in almost simultaneously. What. The. Heck. This piece had been setting there for months; no one else had shown any interest. So why and how was there suddenly another competing offer?! At first we thought the sellers agent was messing with us, trying to scare us into raising our offer. We had put in an offer for lower than asking price. Remember: setting there for months without any interest. We would be morons to offer full asking price. Well, our amazing Relator did some calling around and finally got connected to the sellers. They had moved out of the area to be closer to family as their health wasn't what it was. We learned that they had sold the main house and an additional 40 acres of the horse farm the previous year. The couple who purchased that piece told the listing realtor that if any offers came in for any other pieces of the farm to let them know. Well, the listing agent immediately did just that! Which is fine, but imagine if she had been working for us instead of us sticking with our relator. I can promise you we wouldn't have ended up with our dream property! Our relator immediately instructed us to resubmit our offer and make it for full asking price to match what the other bidder had submitted. We weren't taking any chances so we offered even a bit more than asking. Not much, but it was enough to show we were serious. And then we waited. Finally, later that evening we learned that the sellers were going to stick with the people who had purchased their home and 40 acres. It wasn't about the money for them, they just wanted the land that they had loved for so long to go to someone they knew and they thought would take care of it the way they did. Admirable, but we were heart-broken. So we retreated to our room after putting the boys to bed and started re-evaluating our situation - we already have a beautiful home in a great neighborhood, were we just being greedy? About the time we were coming to the conclusion that we were meant to stay here, our Relator called us. The sellers had had a change of heart and were officially accepting our offer!!! What?! How?! Why?! Well, it turns out our Realtor personally called the sellers and told them about us, about our little boys who we wanted to grow up in the country and our dream to design and build our forever home. Our relator had tugged on the right heart-strings of the sellers and they agreed to go with our offer! I am convinced that we wouldn't have our land without this phone call by our relator. In addition to occasional sponsored posts, Hidden Lake Drive uses clickable affiliate links. That means that HLD may receive a small commission from sales at no extra cost to the buyer. As always, my opinion is 100% my own and I only recommend things that I truly love or use myself. Thank you for supporting this blog. All text and images are property of Hidden Lake Drive and may not be used without permission. . Powered by Blogger. © Hidden Lake Drive | All rights reserved.